Hannah Genders revamps a sustainably-sourced garden. A s many of you may remember, I created a garden at the Malvern Show five years ago in 2011 (hard to believe it was that long ago), which was rebuilt at a farm shop in Alcester. The show garden was essentially an ornamental vegetable garden that I had sourced locally, and the way I kept it local was to source everything on my bike and record how far I had to cycle to find the elements for the garden. Actually, people still remember it and refer to it as the “cycling garden”! It was a great experience and won a gold medal. It has been in the Alcester garden ever since, and recently we decided to change it slightly. It’s gone from being a vegetable garden (which was a lot of work to keep up) to a garden keeping its local theme but celebrating local plants as well. All the wooden structures are locally and sustainably sourced. The original pergola is the one we took to the show, and the trellis and supports for the apple trees are all made of chestnut sourced from Say it with Wood in Herefordshire, as is the lovely chunky picnic table. This product is cut from their woodland and is made from sweet chestnut, a tree that can be coppiced to the ground and regrows to be cut again so is very sustainable. The planting has now been changed from vegetables to perennials and shrubs, but as far as possible I have sourced local varieties. The penstemons in the main beds are all grown in Pershore and named after the villages around Bredon Hill, and all of them are unique and really stunning. 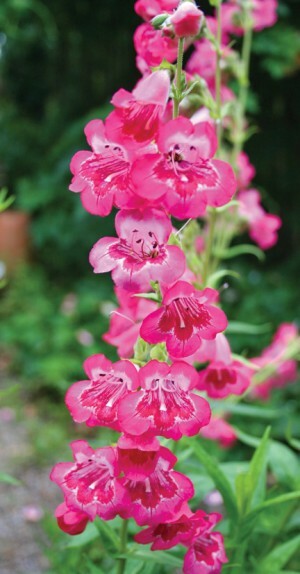 Penstemon ‘Elmley’ for example, named after the village of Elmley Castle, is a striking pink flower, not overly large but holds many flowers on a single stem. Penstemon ‘Comberton’ was selected by Pershore college in 1999 as a new variety and has deep pink flowers with a white throat. And there are many more – we have seven of these local penstemons planted out in the garden. The reason we have so many penstemons local to the Pershore area is down to one plantsman, Ron Sidwell, who bred them in his garden near Bredon Hill up until he died in 1993 and was known for his penstemon displays when he opened his garden to the public. The plant was very popular in Victorian times but had fallen out of favour by the 1960s – it has come back largely due to Sidwell’s persistence in cultivating new and disease-resistant strains. Penstemons are relatively easy to grow; they require full sun and a free-draining but compost-enriched soil. They are quite hungry plants that put on a lot of growth and flower each season, and this is the joy of them – they flower from late June right through July and August when many of our cottage garden flowers have finished, so are well worth adding to your own garden. They don’t need much pruning; I just cut back any very straggly growth in the spring. April is ideal as they can be a bit frost-tender so the top growth gives them some protection through the winter. As an indication of how our winters are warming up, when I started gardening more than 20 years ago you would have instructed clients to cover penstemons and protect them through the winter months, but now it’s not necessary. As I mentioned earlier, we have a number of locally-grown apple trees in this little garden: some “cordon”, where they are grown on a larger frame, and some “step over”, which is a perfect description of them. They are grown on a short frame only about two feet off the ground, on a single cross stem, and then pruned back to this shape each year, and they are low enough to literally step over them. This method is ideal for a small garden to edge a border and they fruit very well considering they are kept so short. Local varieties of apple like this include Worcester Pearmain; the popular little red apple, Pitmaston Pineapple, with a very sweet flavour, and King Charles Pearmain, another great eater introduced by Charles Taylor in 1821. Many of these old varieties of apple are well worth having in a garden, as they keep our local fruit heritage from dying out and they also have great flavour too. All along the front of the garden I have planted Hidcote lavender – Lavendula angustifolia ‘Hidcote’ – which got its name from the famous gardens at Hidcote Manor in the Cotswolds. The garden there was created by Lawrence Johnson in the 1920s, who selected the best cultivars for his new arts and crafts garden; the lavender he chose is a dwarf variety with a neat habit and a very dark purple flower. It’s become such a popular lavender and is recognised as a good garden plant. It was ordered the “Award of Garden Merit” by the Royal Horticultural Society, and I would recommend it for almost any situation. For spring flowers I have planted a pulmonaria that was bred in Clent and is called Clent Sky Silver – it has beautiful spotted leaves, like most of the pulmonarias, and silvery blue flowers, so a great addition to any garden. In promoting these local varieties I’m hoping we can keep them alive and thriving. Many need to be sought out from smaller local nurseries rather than large commercial garden centres, which can only be a good thing. The newly-planted garden is displayed at Hillers Farm Shop in Alcester, and is open every day.